The No. 1 title in hardcover graphic novels is “The Walking Dead, Book 1,” which contains the series' first 12 issues. The eighth and ninth spots on the hardcover list are held by separate titles. The paperback list features “The Walking Dead Compendium” at the top, with other issues in the series ranking third and fourth. That’s three out of the top four books! And it’s not just the graphic novel lists; Kirkman's prose novel “The Walking Dead: The Rise of the Governor,” is No. 18 on the Times' best-seller list for all books. For those who prefer to watch the series, “Walking Dead's” second season resumes February 12 on AMC. Next entry »'X Factor': Will Melanie Amaro take it all? Farmville truly NAILS straight down everything you really like concerning Scott Kirkman’s The Walking Dead; the tension, the climate, the actual setting, the planet, how the tale goes. Simply almost everything, even the comic strip visuals. (The Walking Dead originally is a comic strip sequence in case you didn’t realize) Regretfully, I never received the chance read all the books. The storyplot is fantastic and their is actually several surprises! Ought to buy! Ur too ugly. U cant even make a zombie hard. Can a zombie get a hard on and do me in the rump? I like the graphic novels also. They are so realistic. LOL. 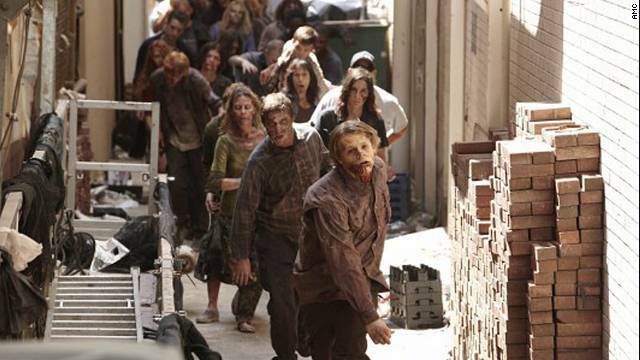 I love how all the non LDS became walkers and zombies. Best show on TV. I absolutely LOVE this show. It is the most accurate portrayal of the end times as fortold in The Book of Mormon. The first season was incredible. This season is dragging along with them being stuck on the farm with all the nonbelievers. I did love when they pulled that non LDS member out of the well and he came in to, though! Thoroughly excellent cinematography and entertainment at its best. So the Walking Dead is another Mormon allegory? Just like Twilight.